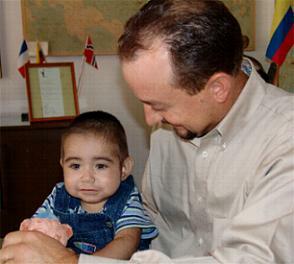 In November of 2004, shortly after bringing Abigail and Andrew home, we received news about a baby boy in Colombia who needed a liver transplant. Within a week, we received e-mails from several friends and Family L ife’s Hope for Orphans asking for help in finding a family for this precious little boy. We immediately started to research his medical condition and search for a family for him. 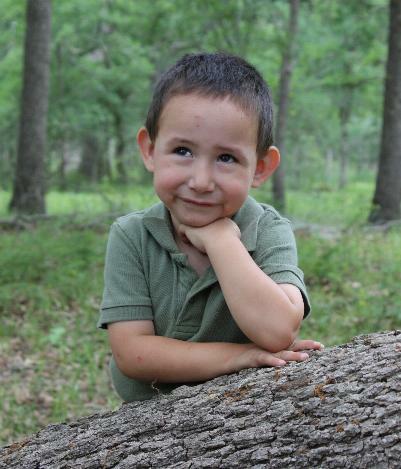 Jonah was born with Biliary Atresia and on the third day of his life, it was determined that the only way to help him would be a liver transplant. He was very jaundice and the pictures we received of him showed a baby with very yellow skin and the whites of his eyes were almost a bright yellowish-green. As we researched his medicals, we learned that more critically, Jonah suffered from severe malnutrition. 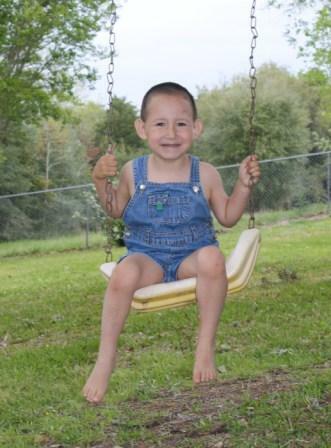 As we spoke with doctors about his medical condition and they reviewed his medical history, we learned that even if everything came together for a Jonah to receive a transplant , he was too malnourished to survive a transplant. It became clear that the first step in helping Jonah was to get him the nourishment that he needed. It was recommended that Jonah come to the US on a medical visa to receive supplemental feeding in preparation for one day receiving a transplant. As we spoke with doctors, many of them seemed incredibly supportive and agreed to help bring Jonah to the US on a medical visa. However, whe n they went to the hospital about getting the letters for visa signed, we were always denied because no hospital wanted to take the responsibility of helping such a special needs child. The doctors always seemed willing to do whatever possible to help, but they needed the support of the hospital. After being refused by our third hospital, we realized that it was not going to be possible to bring Jonah to the US on a medical visa. We explained the situation to the Children’s Home Society and Family Services, the agency that had tried so hard to help Jonah. They were in contact daily with the orphanage in Bogota, Colombia. The orphanage representative explained that they could possibly raise the funds needed for Jonah’s transplant, but that they could not return him to the orphanage after a transplant. After lots of prayer, we decided to start the process to adopt Jonah. Children’s Home Society and Family Services (CHSFS) made arrangements for Jonah to receive a special formula designed to help children who are severely malnourished. They also offered to waive all the fees associated with adopting Jonah. They helped raise the funds needed for his flight to Cali, where the hospital transplant team was and they donated money towards his transplant. It was miraculous to see what all took place to help Jonah. The chance of an orphan receiving a liver transplant is very slim, but God provided people who advocated for Jonah from the day he was born. Still, the chance of finding the exact match was not very likely. It was suggested that his birthmother possibly be approached about being a living donor. The liver is a very unique organ. It has eight separate circulatory systems, so only a portion of a liver is needed. We knew the chance of her doing this was slim to none, but we agreed to allow the orphanage to find her and talk to her about this. To our surprise, Jonah’s birthmother was more than willing. She had such a love for this child, but knew that she could not provide for his care and wanted the best for him. She flew with Jonah and orphanage reps to Cali and began the testing to see if she was a match. If you are not familia r with living organ donations, it should be said that transplants are much harder on the donor than they are on the recipient. Still, this loving birthmother was willing to do this for her son. 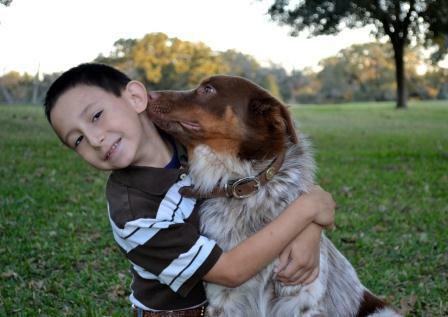 She knew that there was a family in the process of adopting him and she was very happy for him. As Jonah’s birthmother underwent testing, Jonah’s condition became worse. 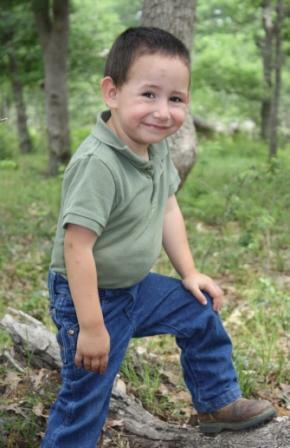 Then at the last minute, a liver became available that was a match for Jonah. 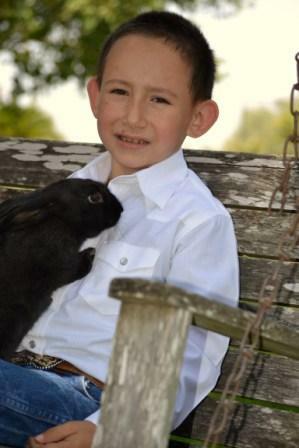 I remember receiving the call that Jonah received the transplant. I had such a mixture of emotions. I was happy for Jonah and sad for the family who lost a loved one. I can’t say that we felt peaceful about anything. It was a very strange feeling. The days after the surgery were very critical for Jonah. He developed peritonitis in his abdomen and there were times when it did not seem that he would make it. His body was not rejecting the liver however, so that was positive, but he had a long road to go to recover. Jonah had a foster mother while in Cali. She was very instrumental in caring for Jonah while he was in the hospital and after. He remained in intensive care for a month and then in the hospital for one week after. His abdomen was so swollen that the doctors could not fully close his abdominal wall. They did a closure of the skin only and not the muscles. After one year or so, when Jonah has grown more, the doctors will close the abdominal wall. On September 21, 2005, we flew to Cali. The following morning, we met Jonah and his foster mother. She spent the day with us. This was the first time we had ever met a foster mother to our children before. It was good, but also difficult. I felt as if I was taking Jonah away from her. Her tears made us all cry. She knew that she could not adopt Jonah, but it was hard to let go of a baby that she had been through so much with. She is a wonderful woman and we thank her for all the help she was to Jonah. After we met with the doctors that day, we said “good-bye” to Jonah’s foster mother. It was hard for all of us. We love Colombia and would highly recommend families considering adopting from this country. * (The Faske family returned to Colombia in 2008 and adopted two more children.) It is a beautiful culture and the people are all so warm. 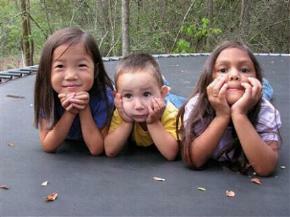 They are very supportive of adoption and are excited that these children will know the love of a family. We are thankful that the Lord has given us yet another opportunity to reach out to child and experience the blessings of having him as part of our family. We do not know how long we will have Jonah, but that is why it is so important that we live every moment to its fullest, that we enjoy our children every day. They truly are a blessing from the Lord. Jonah is a miracle and we are so blessed to be his parents. Jonah has grown so much since he came home. His transplant has done amazingly well and he is a typical little boy in every way. 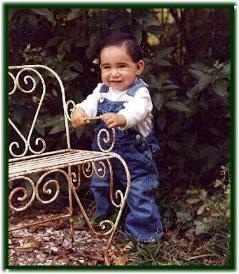 He loves to play in the dirt and is always finding some kind of insect or creature that amaze s his. 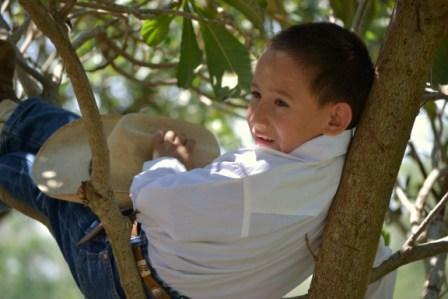 Like the rest of our children, Jonah also enjoys riding horses and showing cattle. Jonah has recently made the decision to move up to the Junior Division in showing. This means that he will no longer be able to have the assistance of an adult or older sibling while in the show ring. 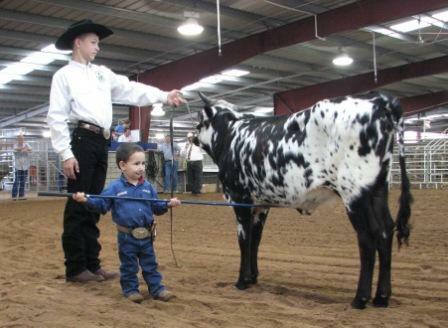 Jonah could have stayed another year in Pee-Wee, but he really wanted to be able to exhibit his Texas Longhorn steer, “See My Buckle” before he was too old to show in the youth division. Jonah’s first two shows as a junior were the 2009 Tulsa State Fair and East Texas State Fair. To our surprise, Jonah’s steer won Reserve Grand Champion at both shows!!! He was officially hooked and can hardly wait for the next show!